With a stay at Loews Miami Beach Hotel – South Beach in Miami Beach (South Beach), you'll be steps from Collins Avenue Shopping Area and Espanola Way and Washington Avenue. This 4.5-star hotel is 0.3 mi (0.4 km) from Lincoln Road Mall and 0.3 mi (0.5 km) from Ocean Drive. Make yourself at home in one of the 790 air-conditioned rooms featuring flat-screen televisions. Complimentary wireless Internet access is available to keep you connected. Private bathrooms with bathtubs or showers feature designer toiletries and hair dryers. Conveniences include phones, as well as safes and desks. Relax at the full-service spa, where you can enjoy massages. You're sure to appreciate the recreational amenities, which include 2 spa tubs, a health club, and a sauna. Additional features at this Art Deco hotel include complimentary wireless Internet access, concierge services, and babysitting/childcare (surcharge). Grab a bite at Lure Fishbar, one of the hotel's 3 restaurants, or stay in and take advantage of the 24-hour room service. Quench your thirst with your favorite drink at the bar/lounge. Buffet breakfasts are served on weekdays from 7:00 AM to 11:00 AM and on weekends from 7:00 AM to noon for a fee. 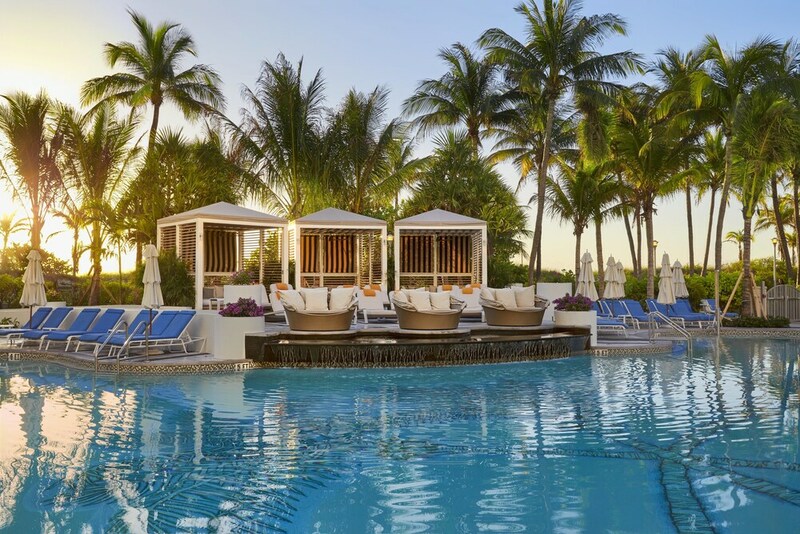 Loews Miami Beach Hotel – South Beach features a full-service spa, 2 spa tubs, an outdoor pool, and a health club. Dining is available at one of the hotel's 3 restaurants. A bar/lounge is on site where guests can unwind with a drink. Wireless Internet access is complimentary. This 4.5-star property offers access to a business center, limo/town car service, and a meeting room. This Art Deco hotel also offers a sauna, spa services, and an arcade/game room. Onsite parking is available (surcharge). Loews Miami Beach Hotel – South Beach is a smoke-free property. Buffet breakfasts are available for a surcharge on weekdays between 7:00 AM and 11:00 AM and on weekends between 7:00 AM and noon. Preston's Market - Overlooking the ocean and pool, this restaurant serves breakfast only. Open daily. Bar Collins - This restaurant specializes in local and international cuisine and serves lunch, dinner, and light fare. Guests can enjoy drinks at the bar. Open daily. Lure Fishbar - This seafood restaurant serves dinner only. Guests can enjoy drinks at the bar. Happy hour is offered. Open daily. Miami Joe Coffee Co. - This coffee shop serves breakfast and light fare. Open daily. Nautilus Bar & Grill - This restaurant is located by the pool. Guests can enjoy drinks at the bar. Open daily. 2 spa tubs are on site along with an outdoor pool. Other recreational amenities include a health club and a sauna. Exhale has massage/treatment rooms. Services include deep-tissue massages, hot stone massages, sports massages, and Swedish massages. The spa is equipped with a sauna.